A Locals' & Visitors' Favorite For Over 45 Years! 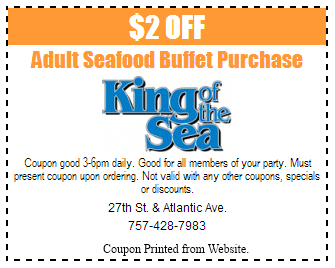 Virginia Beach favorite, King of the Sea is famous for an all-you-care-to-eat seafood buffet including soup, salad and dessert bar. 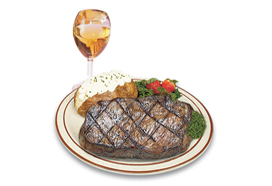 Full menu features great seafood, chicken, steaks, pastas, Caesar salads, Greek salads and childen's menu. Totally renovated with new outdoor patio. Open 3-10 pm daily. Ample parking in the rear. Major credit cards excepted. Our upscale restaurant atmosphere and delicious cuisine allow us to continue to serve as 'A Locals' & Visitors' Favorite For Over 45 Years!'. If you are searching for a restaurant in Virginia Beach but also looking for style, refinement and a memorable dining experience, then King of the Sea is the place. Anytime of the week, bring your family or special someone for seafood cooked to your liking, burgers, pasta or a variety of delicious entrees served in our dining room. I have been vacationing at VB for about 10 years and go to the King every year and have never had an issue. the food has always been good, the staff friendly, and it is reasonable priced.